Heritage Home Design windows and doors will make your house look beautiful, but they also help keep your house warm in the winter and cool in the summer. Based on estimates, it has been calculated that in-efficient windows can add 30 to 40% to your yearly heating and cooling costs. Thanks to the industry-leading technology that goes into each and every one of our products, we can help make your home cozy all year round. The Energy Star program was developed by the U.S Department of Energy and the U.S Environmental Protection Agency to help identify energy-efficient choices for your home. The Energy Star seal is only granted to products that demonstrate significant reduction in energy consumption in the home. The majority of Window City windows and doors meet or exceed U.S and Canadian regulations to be considered Energy Star compliant. A measurement of the amount of energy a material conducts. The lower the U-Factor, the greater the insulating effect, meaning the greater a window resists heat loss. The benefit of windows equipped with lower U-Factor glass is keeping heat loss to a minimum in the cold winter months, giving you uncompromised energy savings. A rating of 0.35 or lower is considered a good U-Factor rating. Co-efficient (SHGC) Solar heat gain co-efficient is a measurement of the amount of solar radiation transmitted through a piece of glass or door material. Southern climates can benefit from low solar heat gain co-efficient (SHGC) glass by reducing the absorption of UV rays coming through the window during the hot summer months. A great choice for dramatically keeping your air conditioning costs in check. 2. Heat loss through frames, spacers and glass. Ratings are based on a positive numerical system. View the interactive display that shows how we pick the right windows for the right location. LoĒ²-272®This high tech glass delivers year round comfort, whether it’s 20 below or 110 in the shade. During the winter, LoĒ²-272© reflects heat back into the room, increasing insulating performance by 96%. In the summer, it rejects the sun’s heat and blocks 84% of damaging UV rays. Not only does this coating provide maximum efficiency to your home, but it helps protect your valued possessions from fading. Tri-Pane Safe Vision™ laminated glass is produced by bonding a combination of plastic vinyl layers and polyester film between two panes of glass pressed into a single sheet. The third pane of low-E coated glass completes the sealed unit. Laminated glass provides maximum safety from breakage, sound transmission and blocks 99% of damaging UV rays. An additional energy efficiency benefit available with any Low-E glass option. Argon gas is an inert gas that is 40% denser than air. This density will create greater resistance to the transfer of heat and cold through your windows and will increase the efficiency of your windows by 30%. Krypton is denser than argon creating even greater resistance to energy transfer through your glass. Krypton performs best in smaller insulated air spaces. 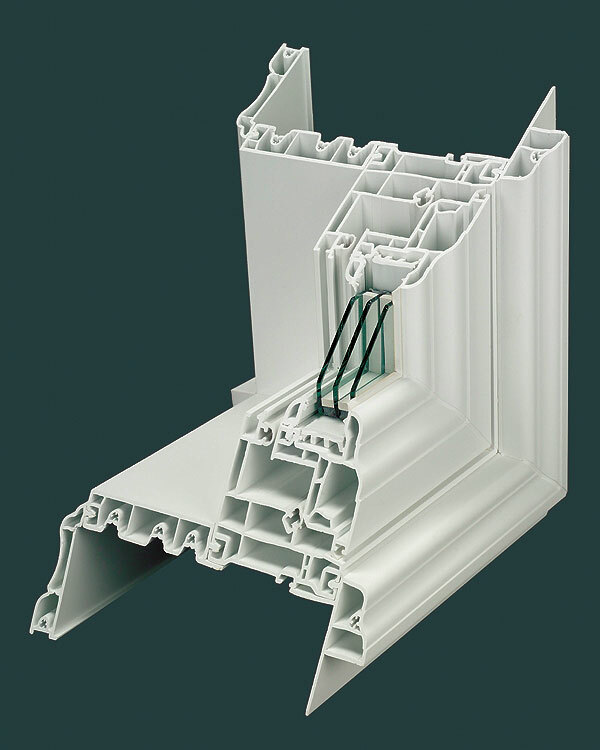 This is an ideal complement to the triple pane units creating higher R-values. Easy to clean window glass just got better with Neat™ naturally clean glass. No manual activation required, just a little help from the sun. The titanium dioxide layer of Neat™ glass reacts chemically with the sun’s UV rays and causes organic materials that are on the glass to decompose. It works even on cloudy days, as 80% of UV radiation gets through cloud cover. Thus when it rains the decomposed dirt no longer clings to the glass and easily rinses away.